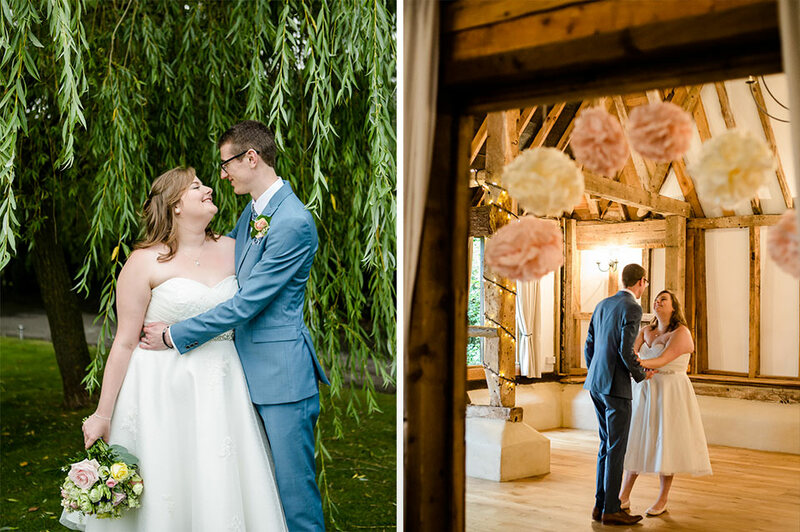 Charlotte and Stuart planned a wonderful summer wedding and were thrilled with the friendly, flexible approach at Clock Barn. 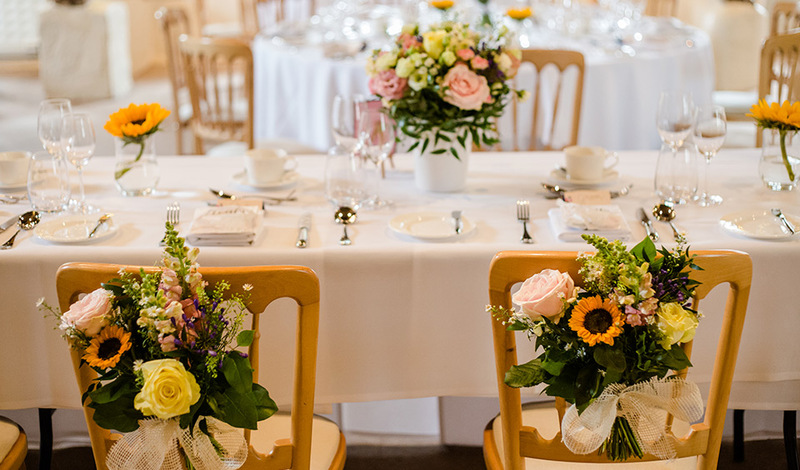 For a glorious summer wedding, you certainly need the right setting and, if you want to cut down on pre-wedding stress, a venue that you can totally rely on is just as important. Luckily for Charlotte and Stuart, they found Clock Barn. “We chose this venue because we loved the relaxed and romantic feel of it and we knew that it would look beautiful even if we didn’t decorate it at all so that took some of the pressure off of us. Also, the team seemed super organised so we knew the day would run smoothly and that we were dealing with professionals.” – Charlotte. 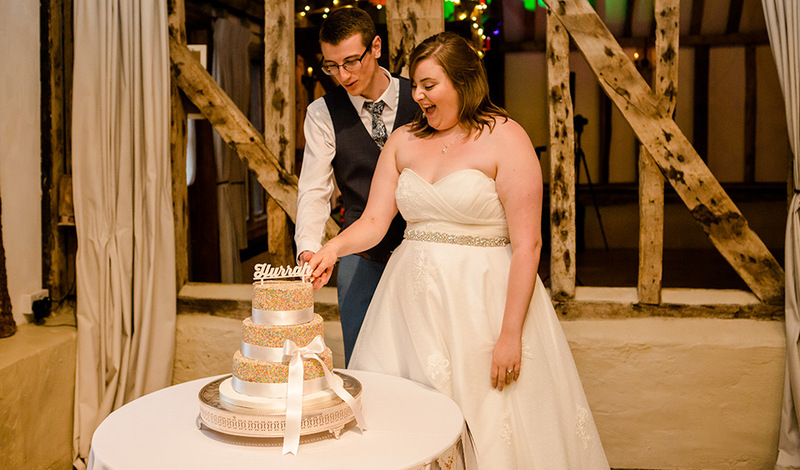 “We knew from the very beginning that we wanted our cake to be covered in hundreds of thousands so we didn’t want a strict colour scheme in the flowers.” – Charlotte. 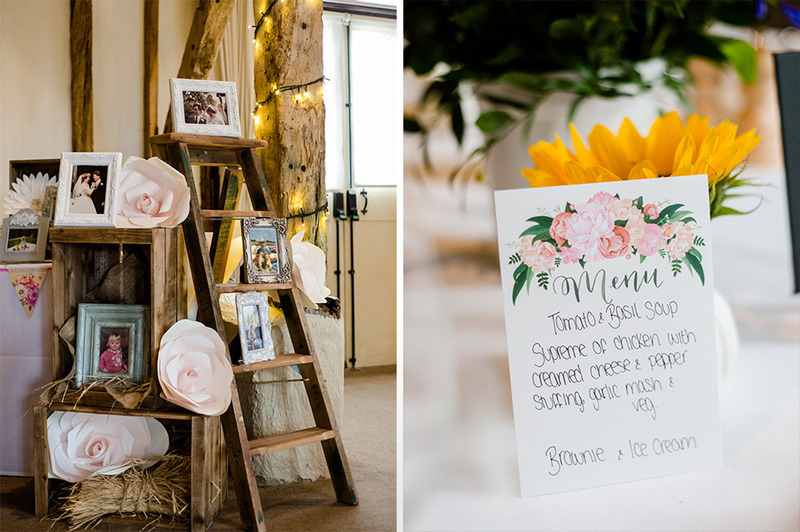 To work with this, the couple decided on an array of loosely structured pastel coloured flowers that brought a big dose of fun to their relaxed and bright day. Charlotte and Stuart also used significant numbers for their tables (86 months together, 2.5 hours married etc.) because they didn’t like the idea of anyone feeling unimportant. “We also wanted to celebrate that our parents are still in long happy marriages so we made sure we incorporated images of them on their wedding days into ours.” – Charlotte. Charlotte wore a gorgeous tea length dress that was covered with tiny polka dots that completely worked with the hundreds and thousands theme. This shorter dress made sure that Charlotte felt as comfortable and as relaxed as possible throughout her special day. “We didn’t want the wedding to feel too formal so we had all the groomsmen wear whatever suits they wanted but bought them all matching ties and pocket squares to link them all together. It worked really well!” – Charlotte. 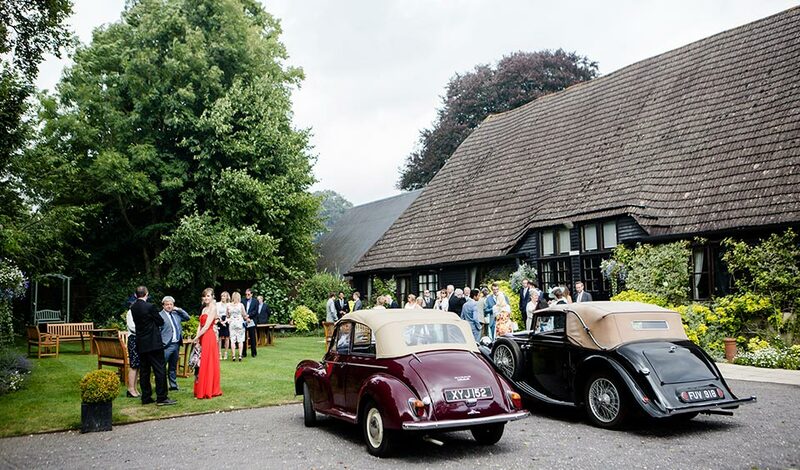 The wedding started with two very special arrivals as the couple made their entrances in vintage cars – Stuart in a Morris Minor and Charlotte in an MG! 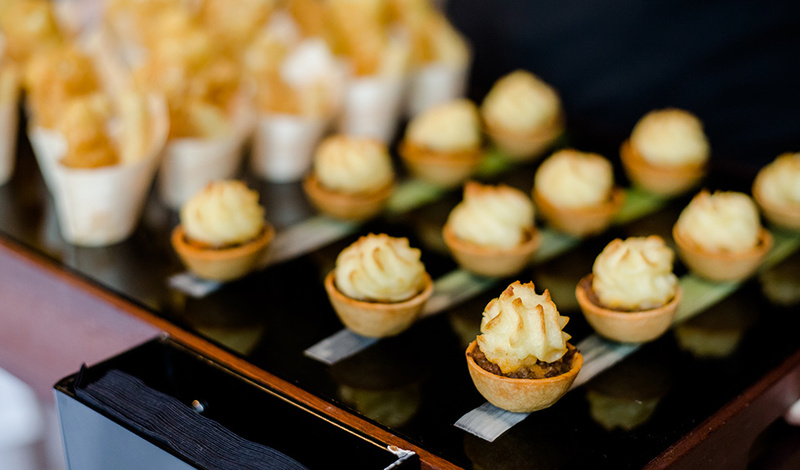 The canapé selection featured mini fish and chips, mini shepherd’s pie, duck spring rolls and mushroom and leek tarts. After that miniature feast, the wedding breakfast managed to make the lucky guests even happier. “Our starter was tomato and basil soup which we were allowed even though it was off menu! We knew everyone would be full from all the lovely canapés so wanted something light to start. 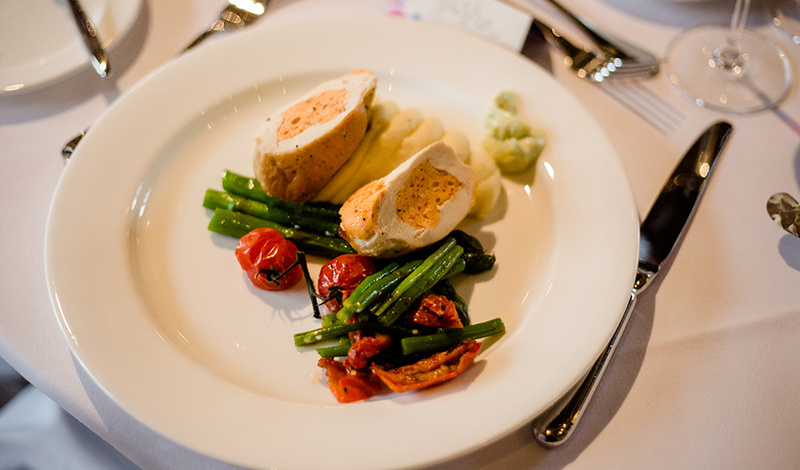 Then there was chicken stuffed with goat’s cheese and garlic mashed potato and then chocolate brownie! Everything was so lovely and we still get comments about how wedding food is generally only mediocre but how ours was delicious!” – Charlotte. 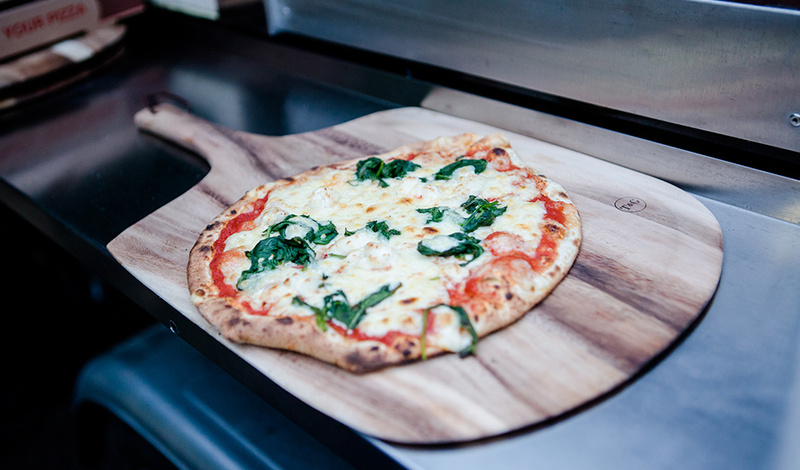 During the evening, the couple served wood fired pizzas that again, totally fitted with the laidback nature of their wedding. Drinks included cocktails and a drum of local ale, which everyone enjoyed. “Definitely break your shoes in properly! 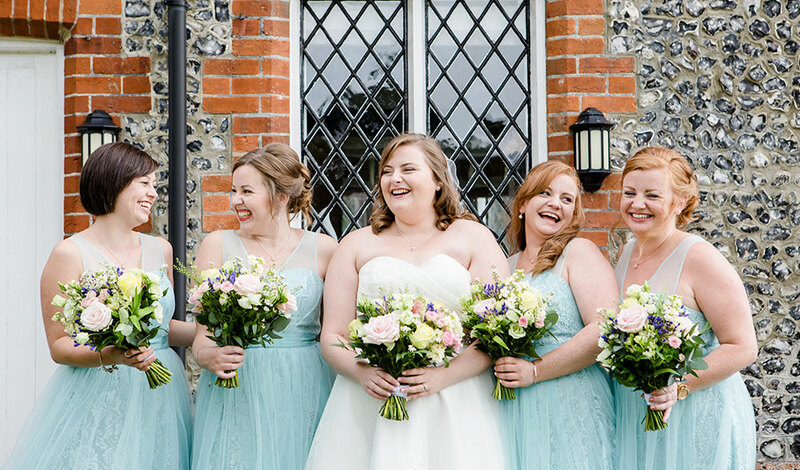 I wore Jenny Packham shoes from Debenhams and I got SO many compliments on them but I had to spend a lot of the day barefoot as I’d not broken them in enough!” – Charlotte. 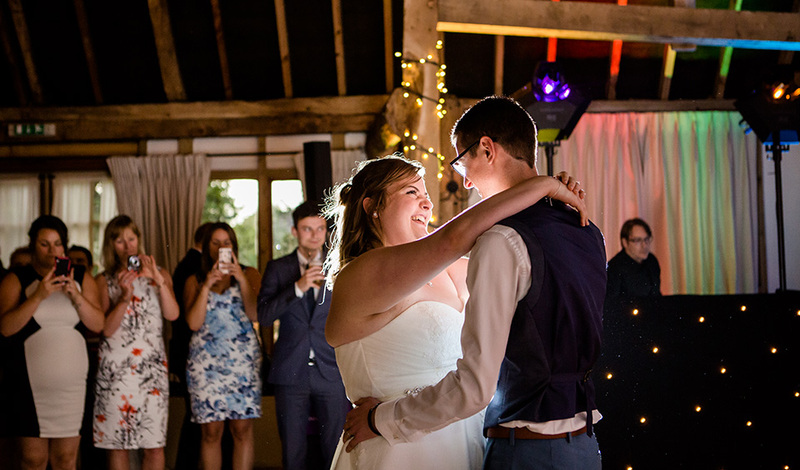 “The Events Team was really great in the run up to the wedding, and on the day itself. They were more than happy to help with anything we needed and were more than willing to work with our ideas so we could have what we wanted. The professionalism and personable nature of all the staff made them a joy to work with, we are honestly so happy we went with this venue, and a lot of that is to do with how great the staff were.” – Charlotte. 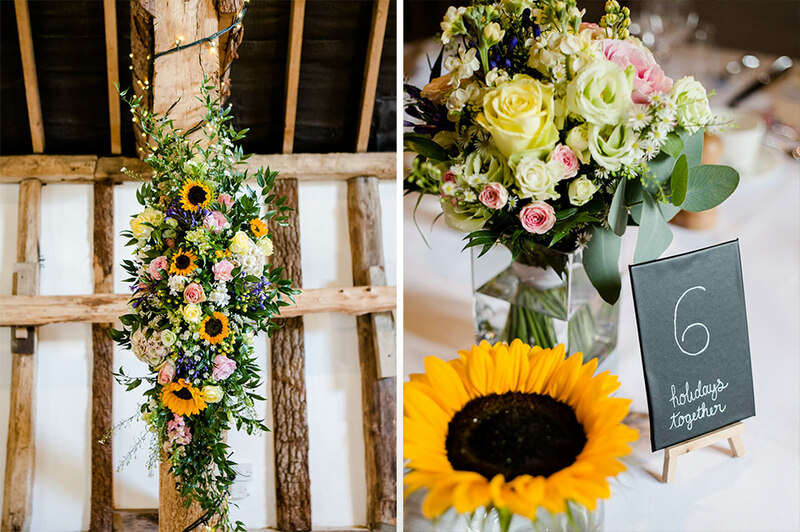 Looking for more summer wedding inspiration for your special day at this stunning Hampshire wedding venue? Then why not check out Siân and Joe’s laid-back wedding day and see if it gives you any great ideas?